FaxZero.com's free fax-your-representative service has been updated to reflect the newly seated members of the U.S. Senate and House. The 115th U.S. Congress convened Jan. 3 and welcomed seven first-time senators and 52 first-time members of the House of Representatives. FaxZero's fax Congress and fax the Senate service lists this "freshman" class along with the returning representatives. "These major updates ensure that FaxZero users have the most current, accurate list of Congress members and senators, so it's easier for constituents' voices to be heard," said Kevin Savetz, who founded FaxZero in 2006. The site lists the names and political affiliations of each representative by district and state or territory. A few officeholders don't accept faxes, so that fact is noted next to their names. Once a user locates his or her representative, it's easy to click on the "send them a free fax" link and type in or upload a message. The name and fax number are filled in automatically. 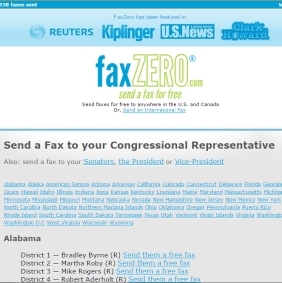 FaxZero also has one-click links to fax the office of the president or vice president. "Faxing is an excellent way for residents to make their thoughts and feelings known on a policy matter, social justice issue, or anything else in which U.S. leaders can play a role," Savetz said. "Since FaxZero's fax-your-representative service is free and online, there are few barriers to participating in the political process." FaxZero users can send five free faxes per day, each a maximum of three pages, to anywhere in the U.S. or Canada. FaxZero also offers a premium faxing option for $1.99, with no daily limit and up to 25 pages per fax. The mobile-friendly version of FaxZero makes it easy to send faxes via a smartphone. There is also an international fax service with prices starting at $2 (depending on the nation faxed) that allows users to send faxes to more than 180 countries. FaxZero accepts documents in DOC, PDF and other common file formats. FaxZero has been featured in publications such as U.S. News, Reuters and PC World since it was created in 2006. FaxZero.com is part of Savetz Publishing, Inc., a company devoted to creating useful and informative web sites of interest to consumers and small businesses.